Donald Duck look-alike as a mere throw-away supporting character in Man-Thing, which he was writing at the time) claimed a share. His contract, he said, didn't grant the company exclusive ownership of the minor characters that come and go in his stories. Marvel disputed this, and the case went to court. As often happens when a freelancer butts heads with a corporation, money for Gerber's legal fees was very tight. In 1982, to help him make his case, Eclipse Enterprises put out a benefit comic book, Destroyer Duck, in which the publisher, along with freelancers such as Mark Evanier (DNAgents), Joe Staton (E-Man), Shary Flenniken (Trots & Bonnie), and Scott Shaw! (Captain Carrot) donated their fees to the cause. The biggest star to come out of Destroyer Duck #1 was Sergio Aragones's Groo the Wanderer. 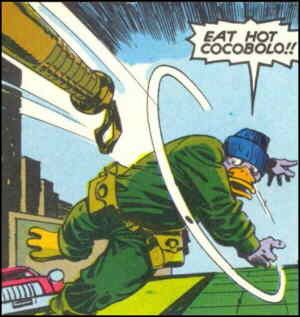 But of course, the centerpiece of the issue was Gerber's own Destroyer Duck (no relation) himself. The artist who worked with Gerber was the legendary Jack Kirby, who, as co-creator of The Fantastic Four, The Avengers, X-Men and many other cornerstones of Marvel's success, had issues of his own with the company. The character started out as Duke Duck ("Destroyer" was only a nickname), a resident of a funny animal world, whose best friend, identified only as "The Little Guy", disappeared before his eyes — just as Howard may have done prior to his sudden appearance in a Marvel comic. It was strongly implied that T.L.G. was indeed Howard, but readers never got a clear enough look at him to be sure. Years later, The Little Guy showed up again, only to die at Duke's feet after explaining he'd been exploited, ruined and finally killed by an extra-dimensional business mega-enterprise called Godcorp (any resemblance to Marvel being purely coincidental). Destroyer embarked on a mission of revenge, which metamorphosed into one of rescue when it turned out the duck who had died was a mere clone of what's-his-name. The mission lasted seven issues of regular publication, the last dated May, 1984. The lawsuit was eventually settled. The exact terms weren't made public, but the character stayed with Marvel. Accordingly, Destroyer kept on trying to rescue his buddy, but only in rare guest appearances with other (non-Marvel) characters Gerber happened to be writing. In 1996, he finally succeeded. Gerber was again freelancing for Marvel, writing a crossover between Howard and Spider-Man. At the same time, at Image Comics (Witchblade, Spawn), he wrote a crossover between Destroyer and Savage Dragon. Each story climaxed in an action-packed but confusing scene which, if the reader looked at them from the right angle, could be construed to have been the same scene. When the dust settled, Howard went off with Spider-Man and The Little Guy, who looked just like him, went off with Destroyer. By the way, The Little Guy's name turned out to be Leonard. Text ©2003-06 Donald D. Markstein. Art © Steve Gerber and Jack Kirby.